When establishing a presence in a new country, trust is the key to positive outcomes. 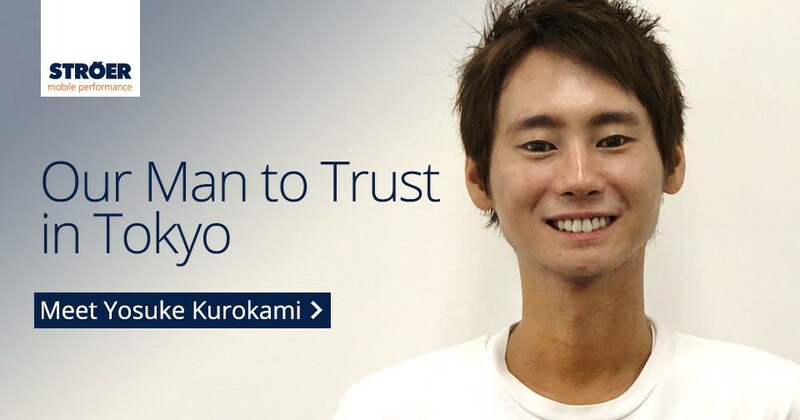 As Ströer Mobile Performance recently announced the launch of its Tokyo office, we are happy to introduce the man in charge of our new Asian operations: Yosuke Kurokami, a mobile marketing industry expert with years of experience and a strong network in Japan. “I look forward to starting in this position with very ambitious plans and a wide open business landscape ahead of myself”, Yosuke says. A cheerful, friendly man of 31 years, Yosuke has a bit of a hard time pronouncing what is part of our brand DNA: the letter Ö. It’s the German umlaut, which lends its unique sound to our company’s overall promise: Ströer Mobile Performance, part of Germany’s largest digital marketer. The complicated letter Ö, the name, the company – all of this will be new to Yosuke’s clients in Tokyo. Yet he is highly confident the package he represents will be of extraordinary interest for gaming, ecommerce and other mobile advertising partners in Nihon. “Asian people, not only Japanese people, love new things, so introducing the new company will be a great chance.” And it will also be a bit easier soon. While the Ö will not vanish, an X may have an additional positive impact on client acquisition. The person in charge of our new Japanese activities joined Ströer Mobile Performance after a variety of stages that exposed him to a multitude of aspects of the business. He started working in the sector in 2012 for a Chinese publisher, went on to one of the leading mobile publishers, where he was in charge of the operation team but also handled sales efforts. Then he went on to another Chinese company, and finally worked with a big player of the app industry for almost two years. On a private note, Yosuke was a fan of Germany long before joining us. His father, a professor of elearning, often travels to Germany, and his mother, a music teacher, is fond of the heritage of classical music Germany has to offer. Yosuke himself has quite a different style of music, having practiced as a DJ until a few years ago. He’s stopped that activity, as he says he finds it hard to stay up so late. And here’s one more thing about Germany that he loves. “Beer, definitely beer. It’s so good here – and so cheap”, he says. So he’ll make sure to arrange for occasional trips to our HQ, even though Yosuke will be on the ground and close to his network most of the year. ようこそ Welcome Yosuke, Yōkoso Yosuke! Ströer Mobile Performance is a fast-growing international mobile marketing company. As part of Germany’s leading digital marketer, Ströer Mobile Performance helps advertisers succeed with mobile-specific campaigns promoting apps, commerce, products or services. The Cologne-based pioneer in mobile performance marketing takes pride in a distinctive personal level of counseling and exceptional support for both advertisers and publishers by a passionate team of mobile marketing experts.